A new fighter has hit the streets! Take control of 25 World Warriors and test your mettle against players from around the world. Street Fighter IV: Champion Edition perfects the winning gameplay formula by offering higher resolution graphics, three new characters (Poison, Ibuki and Dudley) wide screen support for newer iOS devices and a host of updates and refinements. 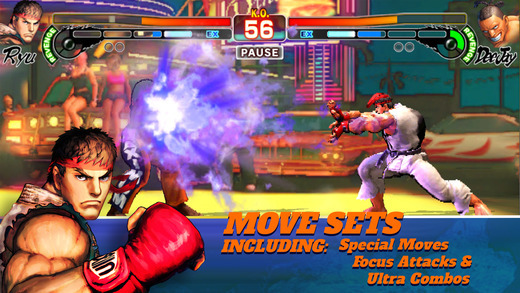 Long time Street Fighter fans can jump into the action and have an instant familiarity with the controls. For more casual players, Street Fighter IV: Champion Edition features numerous settings and tutorials that put you on the path to victory.